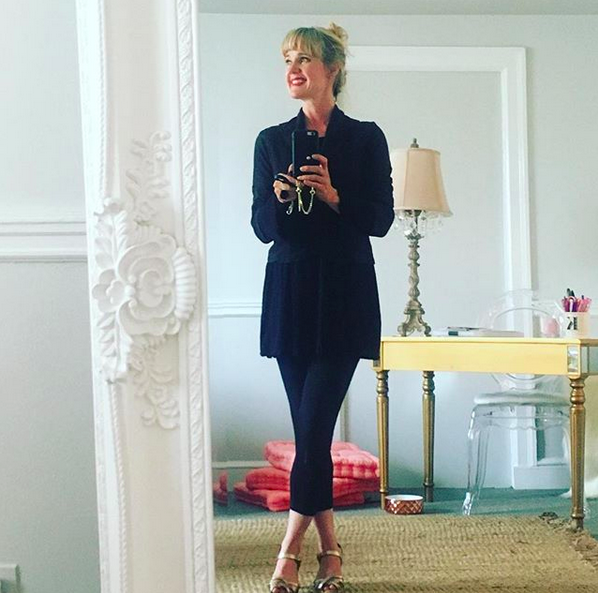 As shared in a recent wardrobe confessional post, each morning I reach for my 2in1 fitted top (wearing the former TranquiliT tulip top with big bell sleeves in this photo) and capri leggings. Yes, year-round. I’ll often layer the look (see these 21 ideas) and yet these two pieces are my foundation. While folding laundry this morning, I put three 2in1 fitted tops and three capri leggings back into their allotted drawers and smiled at how easy my dressing and laundering process had become. Sure, I have a small assortment of skirts, wraps, and dresses hanging in my closet ready to be worn, but they simply serve as enhancement to my foundation. You’ve probably heard of decision fatigue, it’s the struggle of making good decisions when bombarded with decisions to make. For me, having a daily dress up foundation and go-to meals makes my mornings easy peasy. Breakfast is sprouted toast with avocado or peanut butter and banana plus a green smoothie. Having this set routine helps ensure a smooth start to the day. Despite wearing the same foundation most days of the year, it rarely looks that way due to the layering. For example, today as I left the house with the long sleeve wrap tunic over the 2in1 fitted, sleeveless swing tunic, and palazzo pants, I joked to Tim that there should be a limit to the amount of layers one wears. To spice it up, I’ll tie scarves around me neck, hair or wrist, add colorful shoes or boots, and a dab of red lipstick. These small touches can brighten up the most basic look. Consider your mornings, is there a way to simplify its start and still express your signature style? This transition into a new season offers the opportunity to do some spring cleaning and shed those winter habits and heavy layers. Who’s with me?! Years ago I came up with the motto to wear black and live pink. It came from my inclination to wear head-to-toe black clothing (hey, everything matches) and to live with a sense of playfulness and panache. I recently hosted a giveaway on Instagram where I asked people to share how they lived rosé. Answers included ballet, writing Morning Pages, yoga and creativity, wearing pink and vegan homemade herbal lip tint, enjoying the small moments, diffusing essential oils, singing songs from favorite musicals, being compassionate, cuddling with pups, and sipping tea. Ah, just reading each of these transported me to a happy place! What does living rosé look like to you? For me, it’s the same thing as seeking tranquility in the every day. This doesn’t mean that I’m tranquil all day (oh no! ), it means that I seek pockets of it within a full (read: overstuffed at times) life. As mentioned in a recent post, French composer Claude Debussy’s said, “Music is the space between the notes,” and I believe tranquility is found in the moments between the doing. That’s how I envision living rosé. My days begin with caring for our four rescue pets, making morning tea and a green smoothie, diffusing peppermint essential oil, and going on two walks (since the three pups have different paces). Then I’ll settle in for admin work before a soak in the tub and daily dress-up (usually my uniform) followed by ballet three days a week and seeing clients until 8:30 most weekday evenings. Once home, evenings include family time, reading, and reflection. Rinse and repeat. Weekends start similarly, but instead of seeing clients, I settle in for family time, working on projects (hello, forthcoming Daybook), meetups with friends, watching movies, and doing all that life stuff like laundry and organizing. Although laundry and walking pups may not sound like living rosé, one can’t always be on retreat, in a yoga class, or out on the perfect date, so infusing those in-between moments with simple pleasures is crucial to our well-being. Over the next week, consider how you, too, can live rosé by infusing sweet touches into your day. Maybe it’s listening to an inspiring podcast while cleaning the house, being fully present as you wash the dishes and feel the warm soap on your skin, or brewing a pot of loose leaf tea with rose buds versus getting something to go.